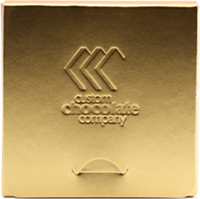 “We have made it incredibly simple to create custom chocolates. Simply upload your design image when submitting your order in the online store and we will return a proof for approval for both the box and chocolate. From this proof your custom chocolate will be created, packaged and shipped directly to you! " You do not require any special design experience to order custom chocolates. Provide any image (jpg, png, tif, psd, eps, pdf etc.) with your design and we will generate a proof. The chocolate and box designs are independent as shown in the following sample. If you wish to use your company logo, ordering can be as simple as providing an image file including the logo and selecting the size of chocolate you wish to create. If you want to create a more complex design, that is an option as well. The only submission required is an image file with your completed design. If creating a design from scratch, we recommend creating a black and white image. 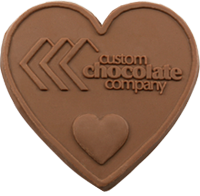 When providing an image for your custom chocolate design, the black part of the image will be raised. If you wish to have your design inset you should invert your image (making the background black and design / logo / text white). When providing an image for your box black sections will be embossed in the box surface. Each box size has a limited area which can be embossed so the box design is typically smaller and less complex. Place your order today!